Squirrel Talk is a blog about the football team Omiya Ardija who play in the first division of the highest rank of Japanese football, the J league. The J league currently has 2 professional divisions, J1 and J2. Ardija means squirrel in Portuguese, hence the name of this blog. 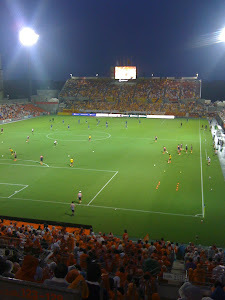 Ardija play in Saitama city which is just north of Tokyo. Saitama city is made up of three merged cities, Yono, Urawa and Omiya. Both Urawa and Omiya have J1 football teams. The Urawa Red Diamonds are a far larger and far more famous set up. However I have been living in Omiya for over 3 years now and follow the fortunes of the Squirrels. Omiya Ardija usually play in a home kit of orange and an away kit of white. Their home stadium is a rather neat, small modern stadium set in a park, which has a lake, a temple as well as other sports facilities. it's a small stadium, with a capacity of around 15,000 people and therefore spectators get a good view from anywhere inside the ground. Unfortunately on rainy days, the stadium doesn't have a roof to talk of, so take waterproofs if you don't like getting wet! The team have been in J1 every season since 2005 however they are regularly fighting off relegation and 12th position out of a league of 18 teams has as yet been their best position. Today we are one day before the start of the J1 2012 season, which will be it's 20th season, and Omiya Ardija are preparing to start the season with a difficult home game against FC Tokyo, a team that has a long history in Japanese football but which last season found itself down in J2. However all pundits are predicting that FC Tokyo will prosper once more this season and they may very well go in to the game in confident spirits, having just had their first win in the Asian Champions League in midweek away from home against Brisbane Roar. Omiya Ardija have spent some money in the off-season and in their own way will also come into this game with a positive outlook. My main reservation is regarding how quickly the new players can gel in to the team and form an understanding. I think Omiya fans will be buzzing with expectation concerning their new Brazilian midfielder Carlinhos who although he is aged 29, looks an interesting prospect for the coming season. Omiya Ardija versus FC Tokyo kicks off on Saturday 10th March 2012 and let's hope for a great game, some exciting football and a win for the Squirrels. Let's go Omiya. Hope so Steve, cheers, Steve! Steve, I don't know a whole lot about Japanese football, or Asian football in general. Can you explain to me how FC Tokyo are playing in the Asian Champions League this season if they were in J2 last season? Is it not just league placing that secures qualification, like in Europe? Or did they win the Champions League last year? Excuse my ignorance!! Hi Dave, that's a good question and the answer is FC Tokyo won the Emperor's Cup and therefore qualified for the Asian Champions League. As far as I'm aware this is standard that the winners of Japan's Emperor's Cup gets to enter the ACL. I guess Leagues have fewer teams over here in Asia and Japan's league has a high ranking.